A sailor from Stone is due to embark on the second leg of a round Britain marathon which is raising thousands of pounds for vital research into cystic fibrosis. 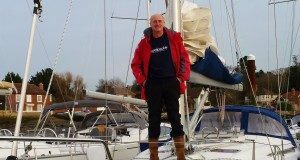 Michael Goodwin is inviting friends and fellow sailors to join him as he sets sail from Greenock, near Glasgow, on an estimated 1,200 mile journey. A seasoned sailor and retired Staffordshire University Dean of Computing and Engineering, Michael has already smashed his £6,000 fundraising target for the Cystic Fibrosis Trust and is on course to raise around £20,000. It is a cause close to 60-year-old Michael’s heart. Son, Daniel suffers from cystic fibrosis and is unfortunately not well enough to join Michael on his adventure. “Cystic Fibrosis is a life-shortening genetic condition which causes the internal organs, especially the lungs and digestive system, to become clogged with thick mucus, resulting in chronic infections and inflammation,” explained Michael. 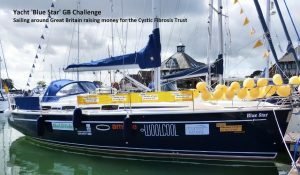 Michael is being supported by Stone company Woolcool, who are a main sponsor of the round Britain challenge and have their logo emblazoned on the sail and hull of the yacht, named Blue Star. Michael has been accompanied throughout his journey by friend Roger Colner from Lymington, Hampshire. Both men hold Yacht Master certification and are experienced sailors. Having set out from the Isle of Wight last spring, the Blue Star sailed up the East coast of England and Scotland before reaching Greenock via the Caledonian Canal. Michael said: “We sailed for around a fortnight at a time before coming home for a short spell and then setting of again with a new set of companions. “It was a cold summer and autumn and we were hit by much bad weather and gales but there were spectacular sites to take in such as the Farne Islands and Lindisfarne. “We completed around 1,200 miles and will probably do more than that on this leg. We go north from Greenock and come down the Caledonian Canal again before heading towards Northern Ireland and along the Welsh coast and down to the South West of England. 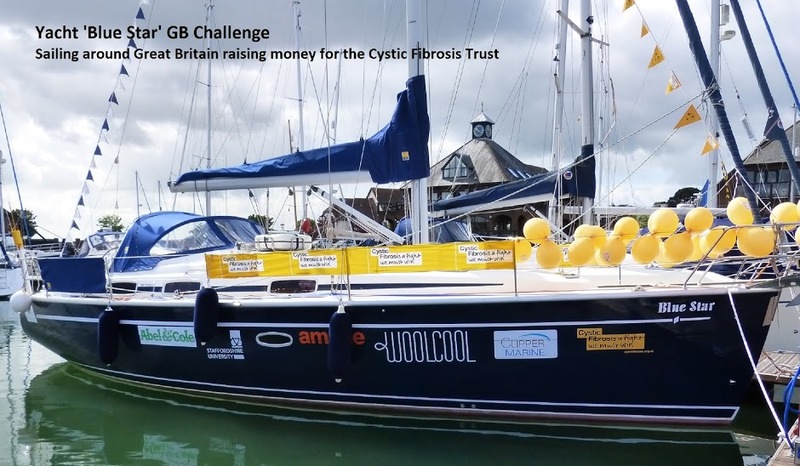 Angela Morris, Chief Executive of Woolcool, is related to Michael’s wife and was keen to help support the voyage along with her husband, Keith Spilsbury, Woolcool’s Managing Director.